San Diego 2014 proved to be one of the more academically rewarding conferences of recent years, mainly because I managed to choose the right sessions (and managed to avoid some reportedly disappointing ones). My strategy during such meetings is to attend some 'core discipline' sessions, that is, pure NT text-criticism, but also devote considerable time to related (mainly philological) areas and pick up some things that are useful for teaching in the general area of New Testament. Though I don't think the Coherence Based Genealogical Method session on Saturday morning was of 'stellar' quality, yet it was the only session in which I presented and therefore a personal highlight. I thought it was a good step in developing a conversation on the CBGM. What came out for me is that there is a real question as to what the 'ontological status' is of the structures that the CBGM is after. Are they in any sense real if they are not 'history'? Or are they simply a reflection of the investigator's own presuppositions? Or what? Something to clarify, I think. Three outstanding papers in the Biblical Lexicography session on late Saturday afternoon. Trevor Evans had a clear and methodologically sound paper on καμινος, showing how useful the Zenon archive is for LXX lexicography. John Lee's paper was unexpectedly surprising. He described the patterns of use of και εγω and καγω in the Pentateuch and how there is a conscious differentiation between the two. There are all sorts of good reasons why this was to be expected and, as with Trevor's paper, there are prompts from the contemporary papyri, where we find constructions such as 'και καγω'. Jim Aitken on epigraphy was good, but I am very much with him already and therefore was confirmed rather than stretched by his fundamental point. Jim's work is a good example of how much primary work there is left to do. Michael Theophilos did something that initially I considered not to be very promising: using coinage for lexical purposes. Unlike inscriptions, the amount of text you can stick on a coin is arguably somewhat limited, without much syntactical context. Yet Michael presented a study on κτισης that was not only very sensitive to the actual artefacts, but fruitful too. The Sunday morning session on the 6th century Tourah Codex of the Psalms Commentary of Didymus the Blind was of outstanding quality. I learned much about the actual manuscript (a palimpsest papyrus with a carbon ink erased text and iron-gall ink upper text), about the type of commentary (transcript of lectures?) and how this papyrus could have been very close to the source. This feeds into the question of the 'quality' of citations from the New Testament, which is quite different from the Didymus works that are written to be more bookish than this work is. All great and exhilarating stuff, yet there was even more. Gregg Schwendner provided one of the highlights of the whole conference by reading a paper on the script, copying technique and copying process of this papyrus. This paper pushed the boundaries of conceptualising what copying is beyond anything I know of. The early Sunday afternoon slot reserved for an Editio Critica Maior session, which consisted mainly of progress reports (useful, but not mind-blowing). 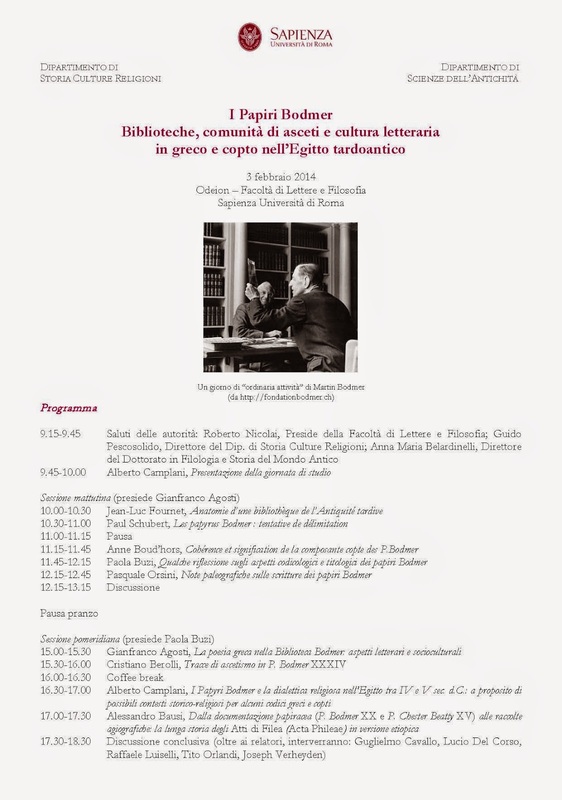 Still there was sufficient good material to be satisfying, Martin Heide on the Syriac of Revelation, Darius Müller on the Byzantine tradition, and especially Theodora Panella on a Greek Paul manuscript with catenae. Though it doesn't contain one of the more wide-spread catena types, its composition is intriguing. I am not sure if this is a manuscript with catenae or a catena manuscript, anyway, it was good fun. The late Sunday afternoon was another real blast, the Textual Criticism of Samuel session. Kristin De Troyer (this is how the surname is given in the program book, I had to correct myself from writing Kristin de Troyer) took us through some of the Hexaplaric marginal notes of Rahlfs 344, a nice clear minuscule. Most enjoyable. Anneli Aejmelaeus discussed the fragments and text of Rahlfs 845, which gave me a good impression of the ways of thinking and natural moves that are current in Septuagint manuscript studies. It is strange that the difference between a good and average presentation depends on a number of factors: level of engagement with the audience, proportionality of presenting discussion and data, selection of relevant topics and time devoted to each topic, and also the quality of thought. This was a pleasing talk in every aspect. Another memorable paper in this session was presented by Aejmelaeus's compatriot, Tuukka Kauhanen. He used a quantitative comparison to locate the (Latin) citations of Kings in Lucifer of Cagliari within the available Greek tradition. There was a lot of good work going here and it will be interesting to see any interaction with quantitative methods such as we are thinking about in New Testament textual criticism. The Monday morning I enjoyed the book review panel of Richard Hays's new book Reading Backwards (I had been to the lectures in Cambridge that are presented in this book and was curious what the likes of Francis Watson and Markus Bockmuehl would make of it), but in the afternoon I had time for one last philology session (again Septuagint stuff) with two mature papers that stood out. Chris Fresch presented on the use of αλλ η as it is used in distinction to other connectives (neat, complete, and convincing), while Peter Gentry discussed some Syriac colophons of Hexaplaric manuscripts. Of course I have a vested interest because a Greek version of some of these colophons appear in Sinaiticus. In this section I had a funny experience while listening to John Meade's paper on the Hexapla of Job. He discussed inter alia the Greek catena tradition of Job, and I did not have a clue what those looked like in practice. This worried me so much that I missed quite a bit of the argument. There is always a risk of losing the audience when you are talking about three or more different versions at the same time, since to the speaker the identity of and boundaries between these different items are more articulated than to the innocent audience, yet I should have been able to benefit more from John's paper than I did. We all admit that an academic conference is not primarily about the academic content – there is so much more; renewing old contacts and making new ones, the conversations, the whispers, seeing people showing off, enjoying the meals and laughter, and perhaps even the opportunities to inspire some to be better scholars. SBL 2014 was a good year. I would like to draw our readers' attention to a fine resource for Greek palaeography and codicology: Pyle which aims to (1) collect scattered resources from various individuals and institutions; and (2) aims to promote interaction among scholars, students and all other persons interested in ancient and medieval Greek manuscript books, providing a place to share knowledge, ideas, projects and news. 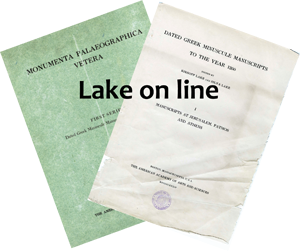 Dated Greek Minuscule Manuscripts to the Year 1200, edited by Kirsopp Lake and Silva Lake, I-X, Boston (Massachusetts), The American Academy of Arts and Sciences, 1934-1939. Conjectural Emendation: Yea or Nay? I am testing the polling function on the new design and thought I would start with something that came up last night at the ETC blog dinner: conjectural emendation (discussed before on this blog). Do you approve of conjectural emendation for the New Testament? 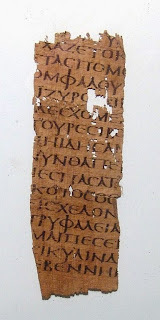 If you are looking for a Christmas present, there is a Homer papyrus for sale at liveauctioneers.com. It looks pretty 4th century to me, and the text is from the Iliad bk 13, 565-580 (lower margin visible). As you can see, we are trying a new look on the blog. Let us know what you think in the comments below. "The date of writing is given in l. 1 and l. 3 as A.S. 880 = A.D.569. This must have been the date of the completion of the work, of which different parts were written at different times; thus 12,4 was written in 561, and 12,7 in 555; 10,12, which I have restored from Michael (see below), would appear, on the prima facie interpretation of the words to have been written in 545 ; but, since the style of the narrative makes it incredible that it was written within a year of the events recorded, " this year 8 " must be understood to mean " this year 8, with which we are now dealing." Throughout the history of Justinian's reign the author speaks of the Emperor in terms which imply that he was still living." Hamilton & Brooks, 1899, p. 5. Simcha Jacobovici and Barrie Wilson have published a new book which is attracting considerable media attention. The monograph contends that a well-known ancient text, “Joseph and Aseneth,” is actually a coded witnesses to an early Christian tradition which believed that Jesus was not only married, but also had children. Although this text is known in Armenian, Greek (the original language), Latin and Syriac, the new thesis is primarily interested in the earliest manuscript, the Syriac witness BL Add. MS 17202. I will survey what I have been able to initially glean from this monograph via Google Books, below. Unfortunately, this medium does not allow me to accompany my quotes with page numbers. Most are familiar with the story of Joseph from the book of Genesis. In Genesis 41:45, Pharaoh gave Aseneth, daughter of an Egyptian priest, to Joseph in marriage. In 41:50–52, Aseneth gave birth to two sons, Manasseh and Ephraim. The apocryphal account of Joseph and Aseneth describes Aseneth’s journey from pagan worship to monotheistic Israelite faith. Jacobovici and Wilson argue that this account is a coded story, which in its interpretation is actually a gospel account. The authors note Artemis is associated with bees (as Athena is associated with an owl), and Aseneth is attacked by bees in the story (ch. XVI). Likewise, Aseneth lived in a tower (mentioned thrice? ), and Artemis wore a tower on her head. Readers should note that Goodacre and Bauckham responded to this a year ago, here and earlier here. Assuming the role of executive director of the Green Scholars Initiative, Holmes will lead a team of researchers and student-scholars at more than 60 universities around the world advancing groundbreaking discoveries on artifacts from the Green Collection. Holmes holds a doctorate from Princeton Theological Seminary, where he also taught New Testament, and continues in his role as University Professor of Biblical Studies and Early Christianity at Bethel University. 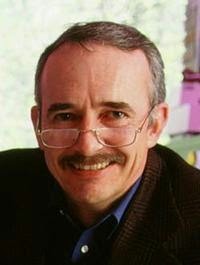 He is a frequent speaker and international lecturer who has authored 11 books on biblical and early Christian writings. Further information on Michael Holmes may be found on his university webpage, here. Congratulations, Mike, from all of us on the blog! For any critical edition of the Greek New Testament a decision is made which manuscript to include in the apparatus and which not. Nestle-Aland 28 divides the manuscripts up between ‘consistently cited manuscripts’ and the others. In the introduction to NA28 a clear (!) explanation is given why manuscripts were included as 'consistently cited'. Eighteen manuscripts were included because they have the ‘initial text’ as their closest potential ancestor. There is also a 19th manuscript in this category, minuscule 468, but this one was replaced with minuscule 307 since the Byzantine text was well represented anyway. In addition to these, 88 and 1881 are added for one of the letters only, 33 because it is so interesting, 1448 and 1611 because they are Harkleian, and 642 because it represents a particular Byzantine group. All the papyri are included as well. We all know that for the Catholic Epistles NA28 is dependent on the Editio Critica Maior, 2nd edition (ECM2) and there the continuous witnesses of the first sub-group above (the 18 + 1) are given under the label ‘witnesses that have A as potential ancestor with rank one’. The term ‘closest potential ancestor’ comes from the Coherence Based Genealogical Method (and if you don’t understand what that is, you should come to the SBL session, which will teach you everything you need to know). What is important for now is that the CBGM is an iterative method, which shapes the overall structure of the witnesses according to the decisions you take during the editing process. You can of course revisit again and again, but at some points you have to publish something. So the INTF published the Catholic Epistles between 1999 and 2005 (Editio Critica Maior, 1st edition), and the shape of the witness tradition at that particular point was reflected in version one of ‘Genealogical Queries’ (the database of decisions and data underlying the text). Lucky for them, the INTF had the opportunity to use the data collected at that particular point to go over the text of the Catholic Epistles again. So the starting point was ‘Genealogical Queries version one’, which developed in the course of editing the second edition of the Editio Critica Maior into ‘Genealogical Queries version two’. What does this mean for the justification of what manuscripts to include as ‘consistently cited witnesses’? The group of important manuscripts as found in the apparatus of NA28 is based on the group the editors started out with when working on the text, but is not the group of witnesses that they ended up with. Three of the manuscripts, at least within the method, appeared less important for the text that was produced then initially thought. If the selection of manuscripts to include in the apparatus was made again today, these three manuscripts might well be deselected (unless they were deemed to be interesting for some other reason). So when do you use ‘Genealogical Queries version one’ and when ‘version two’? If you want to know what the editors started out with for the second edition, you use ‘one’, if you want to know what they ended up with, you use ‘two’. ‘Version two’ reflects the situation at the end of the process. But, counterintuitively, the data from ‘version one’ and not ‘version two’ have been used to draw up the list of ‘witnesses of rank one’ (in ECM2 terminology) which is the same as the first group of ‘consistently cited witnesses’ (NA28 terminology). Current thinking would have left out the three witnesses mentioned earlier. I needed some patient help from Klaus Wachtel to explain the background and that the pressure of publishing was a big factor in setting up ‘Genealogical Queries version 2’ only after NA28 and ECM2 went to press. And I needed Peter Gurry to point out to me that the list in ECM2 had something to do with the consistently cited witnesses for the Catholic Epistles in NA28. I just hope I have explained all the confusion correctly. So what was the interesting thing going on in the apparatus of NA28? Well, three of the manuscripts cited in the Catholic Epistles (442, 2344, and 2492) do not have an obvious right to be there. We don’t make it ourselves easy in this discipline, do we? Sahidic OT Project at Göttingen!!! 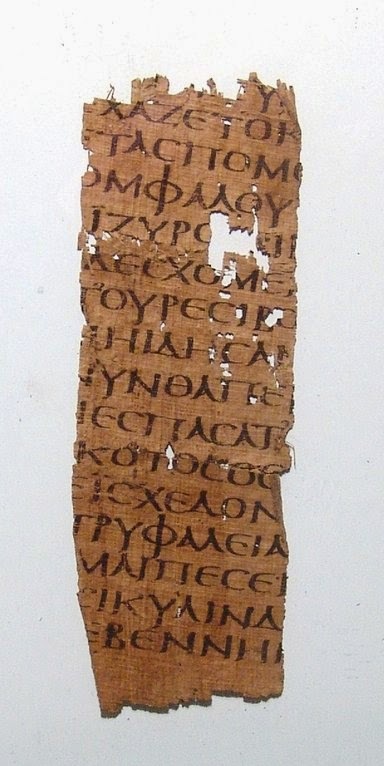 Scholars have long had access to editions of the Coptic New Testament texts. In addition to more recent editions of various NT texts, one could always check the extensive editions of George Horner for the Bohairic and Sahidic NT. The Old Testament, however, has been a more desperate situation, especially in the case of the Sahidic. The Göttingen Academy of Sciences and Humanities has confirmed the funding a complete digital edition and translation of the Sahidic Coptic Old Testament (Digitale Gesamtedition und Übersetzung des koptisch-sahidischen Alten Testaments), here. The project will run from 2015–2036 with an annual budget of €500,000. Heike Behlmer (Göttingen) and Frank Feder (Berlin) will oversee the project. Although this project will doubtlessly be a great support to the Septuaginta-Unternehmen, it will be housed in the Egyptology department at Göttingen, an international center for Coptic scholarship. Sometime in 2015, we can anticipate hearing positive news about funding for a major Greek LXX Psalms project from Göttingen.